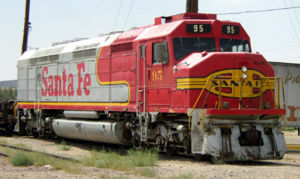 Santa Fe's EMD FP45s were the first locomotives to pull Super C consists. #95 (see here in July, 2003 at the Western America Railroad Museum in Barstow, California) began life in December, 1967 as Santa Fe #105. The Super C was a premium, high-speed intermodal freight train operated by the Atchison, Topeka and Santa Fe Railway from 1968 to 1976. Dubbed the "World's Fastest Freight Train," the all-TOFC (trailer-on-flatcar, or "piggyback") and container train's route ran from Chicago, Illinois to Los Angeles, California on a 40-hour schedule. The brainchild of company president John S. Reed, the Super C (led by a pair of EMD FP45s) made its inaugural run on January 17, 1968, covering the distance in a record-breaking 34½ hours and averaging 63.7 miles-per-hour (108.4 km/h) in the process. For an added fee of $1,400 per trailer shippers received guaranteed fast delivery. 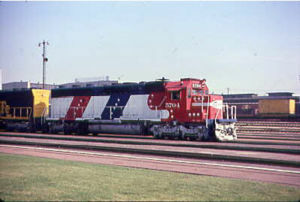 Santa Fe first experimented with high-speed freight operations on its Illinois Division in late 1966. By year's end, a set of passenger-geared GE U28CG locomotives was able to transport 19 piggyback cars from L.A.'s Hobart Yard to Chicago in 61 hours. On June 8, 1967 a joint run using New York Central's Flexi-Van container cars traveled from New York City to Los Angeles in 54 hours, 21 minutes. The train's cargo typically consisted of such high-priority items such as auto parts and electronic components; the United States Post Office was a consistent customer. Though the size of the Super C's consist on a day-to-day basis varied from as little as two to as many as 15 or 20 cars, it always generated positive public relations for the railroad as it tangibly demonstrated the Santa Fe's ability to provided expedited freight service over its modern rail system. In the end, too few shippers opted to pay the premium for 40-hour delivery, especially when considering that a standard TOFC load arrived in just 15 hours more. The final blow came in 1976 when the Santa Fe lost its USPS contract to a joint venture of the Chicago and North Western Railway and the Union Pacific Railroad, who could deliver the mail at a lower rate, albeit more slowly. The hotshot freight concluded its last cross-country trip on May 20, 1976. Bryant, Jr., Keith L. (1974). History of the Atchison, Topeka and Santa Fe Railway. Trans-Anglo Books, Glendale, CA. ISBN 0-8032-6066-0. "Santa Fe's SUPER 'C' : The World's Fastest Freight Train" article by Jack Elwood at the Santa Fe Railway Historical & Modeling Society official website. Santa Fe #5704, one of five EMD model SD45-2s specially decorated in red, white, and blue to commemorate America's Bicentennial, leads the Super C high-speed intermodal train. This page was last edited on 16 January 2008, at 15:50.